Bluff or War Preparations? What about the Kim/Trump Summit? Last Thursday, on May 24, US President Donald Trump cancelled his meeting with DPRK leader Kim Jong-Un scheduled for June 12 in Singapore. The next day it was announced that negotiations still could take place, but it is clear that the sides will drive a hard bargain. 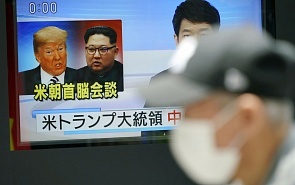 In his interview for valdaiclub.com, Andrei Lankov, professor at the Kookmin University (Seoul), discussed the background of what is happening, the tactics of Trump and Kim and the possible scenarios for the future. Over the past 4-5 months, North Korea has held an unusually mild position. It made some concessions, agreed to many things and gave up on positions which could be used for bargaining at the negotiations. Here are the most eloquent examples. First, it was the unilateral moratorium on launching missiles and conducting nuclear tests. Second, the verbal agreement to tolerate US-South Korea maneuvers – not any, but some. Third, the recent closure of the nuclear test site. Fourth, releasing the Americans detained in the DPRK for what is considered illegal in the country. In fact, all of these concessions were inevitable, but it is one thing when you make them unilaterally and quite another when you make them in exchange for reciprocal concessions on the part of the other side. The process was complicated by vice president Pence and national security adviser Bolton, who insisted that North Korea must hand over everything in line with the Libyan scenario. They did not say a single word about any reciprocal concessions. In this situation, North Koreans decided to snarl and made two rather tough statements. The DPRK delegations quite impolitely, but in its own style, boycotted the joint meeting on preparations for the summit. Most likely, they just wanted to show that they were outraged with what was going on and to require some concessions or at least more cautious expressions. I must say that they had every reason for such anxiety, although they did behave too roughly. At that moment an interesting thing happened. In the past, we saw North Koreans quitting the negotiation process after seemingly innocent moves made by their rivals, and it was hilarious to see Americans using the same technique. Unexpectedly, Trump said that North Korean statements (understandable and rather mild by their standards) are an indication that the DPRK does not want to negotiate, and cancelled the meeting. What is going to happen next is a difficult question. There are two possibilities, and it will become clear in a week or two which of the two is to be realized. First, it is possible that everything is just a performance. If Trump bluffs, then all of this was done not in order to break the process, but to exert additional pressure on North Koreans, forcing them to make some additional concessions. It is not the worst option, so the negotiations are most likely to be continued, a meeting will be held and a compromise, certainly more tilted toward American interests, will be achieved. The second option is more likely and certainly more dangerous. It may happen that Trump found that the negotiations lack any point, at best leading to freezing or reducing the North Korean nuclear program, but not to destroying it. That means that we return to a rather dangerous situation, which was observed last year. Trump and his colleagues likely overestimate the military and political capabilities of the US and underestimate the military and political capabilities of North Korea. Therefore, if they really abandon the negotiations, regarding the unconditional surrender as the only acceptable solution, we can expect a constant escalation of military pressure on North Korea. What will Pyongyang do? Their first actions demonstrate that they did not expect such a turn with the Americans reacting quite the same way as they did several times. Now they are trying to speak in a conciliatory, calm tone, emphasizing their readiness to resume contacts. If Trump really decided that he would not speak to the North Koreans until they capitulate, then they have several basic options. If they fail to resume negotiations, they are most likely to seek some help from China. Over the past decade, China has almost monopolized the DPRK’s foreign trade. Therefore, the implementation of the US sanctions depends on its position: if China decides not to implement the sanctions, they will not be implemented at all. North Korea may also ask China to support it in case of an American attack. This is surely not about sending troops, but about support in logistics, weapons and intelligence. However, even limited support will be enough to prevent a blitzkrieg victory for the US if a war begins. Will China agree on this? It is also a difficult question to answer. Its agreement will depend on the state of the US-China relations at that moment and on the specific contacts between Beijing and Washington on the Korean issue. Even if China agrees to patronize North Korea, it could ask for a serious price, which the North Korean leadership may find unacceptable. If it is not able to agree with China, then two scenarios are possible. The first one is that of quite cautious behavior on the part of North Korea, trying not to provoke the US and waiting for the end of Donald Trump’s presidential term. The second one is that of upping the ante in order to demonstrate that a possible US attack on the country will cause severe military and political consequences. In this case, we can expect a chain of nuclear tests and missile launches, some of them probably carried out in a deliberately provocative manner. For Russia, all of the above scenarios are negative, although their level of negativity may differ.